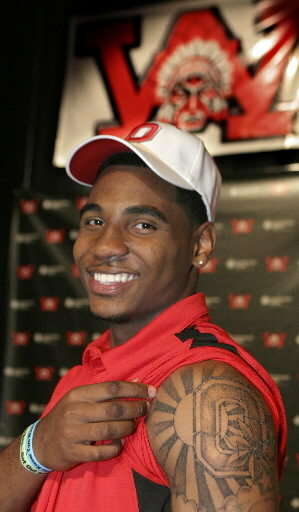 Braxton Miller was everything but outspoken. He arrived in Columbus during that awkward period when the head coach he had committed to in spring was no longer there in the fall. His quiet personality suddenly fit the times; Braxton never talked too much - let alone raised his voice - which was on-brand for a 2011 team that didn't end up saying much at all. His predecessor Terrelle Pryor, who followed his coach out of town that summer, was as alpha a quarterback as Ohio State has ever had. He was intimidating even while standing still. Miller at least had to twitch to intimidate people. He just didn't have to speak. Even his verbal commitment to play for Ohio State was non-verbal. Braxton's legs and underrated arm spoke on his behalf - the countless plays he made that you've already forgotten about would be the opening highlights in just about any other quarterback's reel. As valuable as he was to the team, he was not a captain until after his season-and-position-ending injury in 2014. Braxton would be a repeat captain in 2015, alongside his QB replacement then-sophomore J.T. Barrett, who would be benched in favor of Cardale Jones to start that season. Barrett did his talking the traditional way - with his mouth - and was easily the most vocal QB the Buckeyes had since Troy Smith. QB1 @JT_theQB4th was 33-39 with 328 pass yards, 95 rush yards & 4 TD, including 13-13 in the 4th quarter. As a four-time starter against Michigan. The three-time captain who played on one leg and took the blame for everything was Ohio State's designated speech-giver for over half of Urban Meyer's tenure in Columbus. For 55 straight games, whether he was benched for Cardale Jones or suspended for one dumb night out, it was always J.T. playing the role of cool dad and hype man for the team. Braxton-to-J.T. was a stark contrast in style, but Barrett wasn't even Urban's first 2nd string QB captain (that would be Kenny Guiton) and once the midnight struck for Cardale and he turned back into a pumpkin, he never stopped being that supportive team-first player from the sideline or anywhere else. When Barrett needed a ride home from the clink that night, he called his Cardale for a ride. Four years later they still hang out. When Barrett finally ran out of eligibility after 19 seasons in Columbus, he passed his leadership torch to a teammate who had been on the receiving end of 40 of those pregame speeches. Parris Campbell said he will take over for J.T. Barrett as the Ohio State player who gives the team a pregame speech. We'll always have Parris. John Simon, but a smidge faster. Alpha as hell. So leadership from the quarterback position hasn't had just one flavor. Joe Burrow, a virtual lock to have been Urban's e i g h t h captain last season graduated and took his remaining eligibility to where Dwayne Haskins wasn't on the depth chart. Ohio State's new quarterback would be more Braxton than Barrett as a vocal presence, although no one would confuse their highlights or style for each other's - except maybe this guy. Even while still in high school, Haskins' eventual backup Tate Martell played the role of the inauthentic, blustery antagonist from the movie script written so even the most primitive cinemagoer was in on the facade, and this was long before Justin Fields ever thought about leaving Athens, GA.
Martell doesn’t see why he would leave simply due to Fields ending up at Ohio State. A week later Fields sat in the Schottenstein Center flanked by Meyer and Haskins and the fantasy became reality. Fields made some bold social media moves (*old man throat clear* the kids, they notice this stuff) and moments later, Martell rolled his own credits. Last weekend Fields liked both the best throw of the game and an interception on Instagram, neither of which came off his hand. Passive-aggressive? Fields is anything but passive. He didn't move out his home state for the first time in his life to take another backseat to an incumbent. Neither he nor Matthew Baldwin have started a college game, and Garrett Wilson is going to make anyone look good provided the Buckeyes don't dust off the 2015 offensive strategy. Two captains return from the 2018 team, both of whom play on the side of the ball that kept opponents in games. Titled leadership from the offense is going to have to emerge. That probably won't be from a quarterback for the second straight year, which is an odd element of continuity for a program that's turning over a ton of stars and, you know, one of the greatest coaches ever. Leadership from the backfield has come in many flavors over the past few seasons and decades. The guys fighting for the spot vacated by a millionaire-this-month will shape what that looks like in 2019. Fields leaving Georgia for Ohio State spoke volumes. But we'll see in fall if he's outspoken.